A Man Called Ove is the first novel by Swedish blogger and author Fredrik Backman, and what a great uplifting read it is! Ove is a 59-year old grumpy, lonely man who thrives on routine and principles, and who gets extremely bent out of shape when he encounters people who don’t. Needless to say, he has more than his fair share of opportunities to get annoyed, some of which are quite amusing. Backman flips back and forth between the past and present, and so over time we learn Ove’s story from his lonesome childhood to the lucky day he found his lovely wife, from his stubborn quest for perfection in everything to his biggest emotional challenge, from his social awkwardness to his warm heart. Ove’s wife of forty years has recently died. As the only person who really ever understood and loved him, she helped him put things into perspective and gave him a reason to go about his daily activities. Lonely and without a sense of purpose, Ove is contemplating suicide, a feat that proofs hard to achieve. Enter the new neighbors into the story: Parvaneh, a young pregnant wife with two children and a somewhat aloof husband, is often in need of a capable handyman and driver. Her charming persistence is the perfect way to deal with Ove’s very irritable moods. Other neighbors, from a previous friend whose husband has Alzheimer’s to a young adult whose homophobic father throws him out ask for his involvement. Slowly and with great reservations, Ove is pulled out of his shell. A Man Called Ove is a heartwarming story for its belief in humanity – as in the sense of kind and gracious people seeing beyond the surface and pulling together to do good for each other. This title is available at the Cedar Rapids Public Library in both large and regular print. Enjoy! I finished reading (listening to) My Grandmother Asked Me to Tell You She’s Sorry! It was sooooo good! 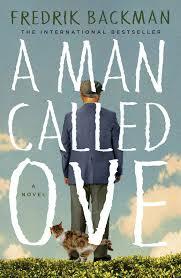 I want to read A Man Called Ove now!